Thermophiles have several beneficial properties for the conversion of biomass at high temperatures. Thermomyces lanuginosus is a thermophilic filamentous fungus that was shown to secrete 40 glycoside hydrolases and 25 proteases when grown on different carbon sources. Among the 13 identified glycoside hydrolases with high expression levels, 9 were reduced sugar glycosidases (RSGs) belonging to seven GH families, and 7 of the 10 identified proteases were exopeptidases belonging to six different protease families. High expression of RSGs and exopeptidases may allow the fungus to efficiently degrade oligosaccharides and oligopeptides in saprophytic habitats. 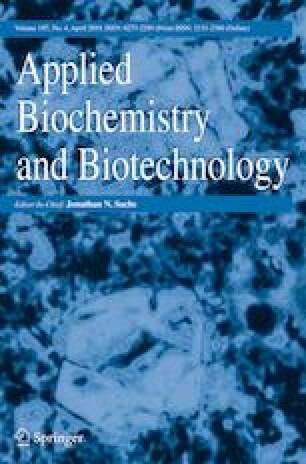 There were no xylan side chain-degrading enzymes predicted in the genome of T. lanuginosus, and only one thermophilic GH11 xylanase (g4601.t1) and one GH43 xylosidase (g3706.t1) were detected by liquid chromatography-mass spectrometry/mass spectrometry when T. lanuginosus grown on xylan, which led to the accumulation of substituted xylooligosaccharides (SXOS) during corncob xylan degradation where SXOS output made up more than 8% of the total xylan. The SXOS are beneficial prebiotics and important inducers for enzymes secretion of microorganisms. Thus, T. lanuginosus exhibits distinct advantages in utilizing cheap raw materials producing one thermostable xylanase and the high value-added SXOS as well as microbial inoculants to compost by batch fermentation. The online version of this article ( https://doi.org/10.1007/s12010-018-2873-5) contains supplementary material, which is available to authorized users. This work was funded by The National Natural Science Foundation of China (31770054), The National Key Research and Development Program of China (2016YFD0800601), and The Key Technologies R&D Program of Shandong Province (2015GSF121019).